It was only by accident that I found your web page but I'm glad I did because I was just about to do a makeover on my garden and "bin" 3 nice big aloe vera plants with numerous "babies." Instead, I have potted the large plants and also potted 35 small ones. I live in Australia so hopefully the weather here means it won't be too long until the small plants are big enough to harvest the leaves. So thank you for all the info on your web page as I'm certainly going to be taking your advice on eating the aloe gel......Regards, Eric Thomson. I was thrilled! Far too often, to my way of thinking, people are destroying or throwing out perfectly good aloe vera plants because they don't know what they have there! So my call to you is, don't throw them away! 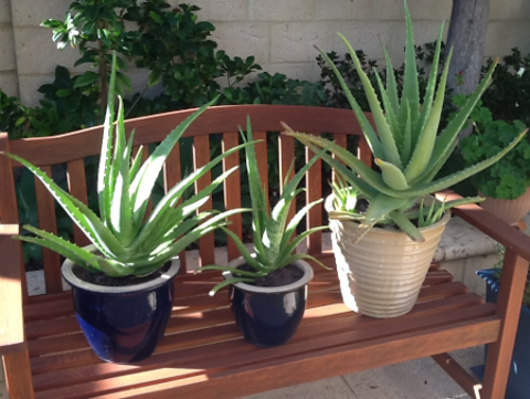 Please, rescue ignored aloe vera plants where ever you find them! This morning I got another email from Eric with two photos of his plants. They are gorgeous! Beautiful! My wife and I started taking the gel yesterday and we didn't really mind the slightly bitter taste.......So once again Ruth, thank you and feel free to use these photos if want. Again, I am so very pleased, and hope you, my dear reader, will keep your eyes open for aloe vera plants to rescue. Maybe your neighbour is throwing hers out, or you find some dumped beside a public path. Rescue these precious plants. Get them into a container - unless you live in a warmer climate without winters like we have here in Canada, in which case you can plant them outdoors. Maybe in a shady spot so they don't roast in the sunshine. 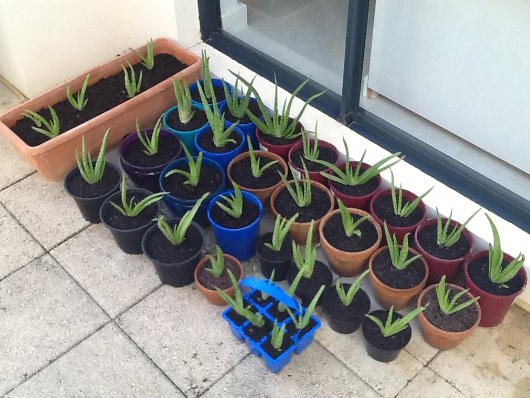 As Eric's baby aloe vera plants grow, word might get around and people will come asking to buy them from him. I've said it before and I'll say it again, the one question I get asked most often by visitors to my website is, "Where can I find or buy aloe vera plants?" They like the idea of harvesting this healthy plant right at home, but don't know where to buy them. (I think there is a business idea in all of this, but I already have my hands full of projects, so you may run with it if you want). Please let this message stick; If you find cast-aways, please rescue ignored aloe vera plants.